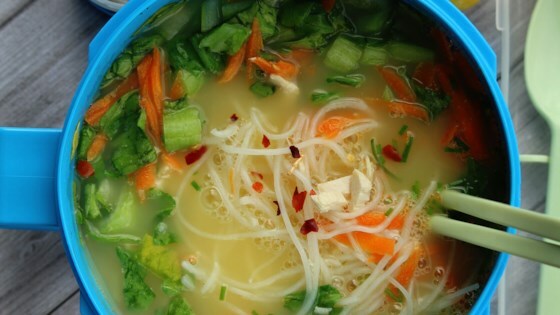 "Protein-rich noodle soup that you can whip up in no time. Add all the ingredients in a portable container and just add water and egg when you are ready to eat." Combine rice noodles, chicken, bok choy, carrot, green onion, dashi, nutritional yeast, ginger, black pepper, white pepper, and red pepper flakes in a large, portable bowl with a lid. Combine tamari, sesame oil, and miso paste in a small, portable container. Cover and shake until combined. Add hot water to the noodle bowl when ready to eat. Push aside the noodles and crack egg into the middle, stirring constantly with chopsticks. Close lid and let sit until noodles soften, about 3 minutes. Remove the cover and pour in tamari mixture. Just as the title says – a fancier version of a classic dorm room staple! This is fantastic. If miso and nutritional flakes are not things you normally have on hand, it's worth changing that just to be able to whip this up on demand. Great use for leftover chicken. I Quadrupled the recipe and made it in a big bowl. Used chicken broth and miso paste concentrate. Loved it! Thanks for the recipe!